Ivy Bridge is the upcoming Intel’s processor. Ivy Bridge is a tick, a variant of an existing architecture, here Sandy Bridge. But this new processor won’t be a simple variation, because Ivy Bridge GPU will be Direct3D 11 compliant! 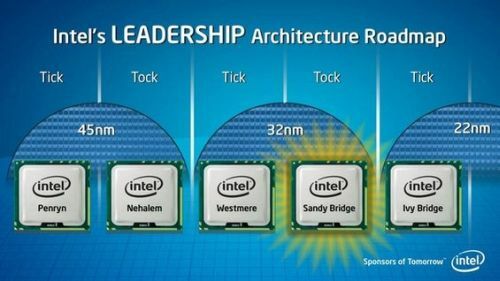 Ivy Bridge will use a 22nm process allowing Intel to pack more execution units (or EUs which are the GPU cores) on the die. The rumors say that Ivy Bridge will feature 24 EUs while current Sandy Bridge packs a max of 12 EUs (in HD Graphics 3000). Considering that Sandy bridge is just out, I take it that these babies will take some time to get released, right? I may skip Sandy. Dunno yet. Dream on! OpenGL never was a high priority for Intel’s graphics dev team in the past. DX11 performance my a*s. It’ll never compete with AMD or NVidia in 3D graphics space. Move alone.